Walter Bott asked how he could better control Windows 8's built-in Photo app--the one that usually presents a small slide show in its Start page tile. I've discussed this app briefly before, in How to better control Windows 8 slide shows. But this time around, I want to touch on two issues I didn't cover back then: How to turn on and off the little, tile-based slideshow on the Start screen, and how to control what pictures turn up on that slideshow, and in the Photo app in general. First, you don’t have to run the Start page slideshow. To turn it on or off, right-click the tile (or press and hold if you're using a touchscreen). Some options will appear at the bottom of the screen. Click or tap Turn live tile off. If you change your mind, you can always click Turn live tile on. The app shows all of the photos in your Pictures library. You can therefore control the selection by moving pictures in and out of the folders in that library. You need to do this in File Explorer, in the old-fashioned Desktop section. You can also control what folders are recognized as part of that library. 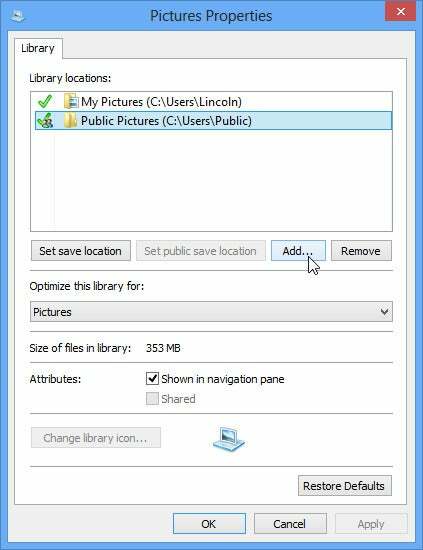 In File Explorer, right-click the Pictures library in the left pane and select Properties.The Add and Remove buttons should be self-explanatory. You can also include photos from your accounts in various cloud-based services. Click or tap the app and wait a bit, and you'll find options to display your photos from SkyDrive (of course), Facebook, and Flickr. You'll have to give the program your logon name and password for the service.